Nicole by OPI Saran Wrap Mani! Is that not a perfect, shiny red? Love! I started with a base coat of Nicole by OPI’s new 3-in-1 base/strengthener/top coat, and added one coat of American as Apple Pie. I let that dry naturally. Once the colour is dry, work one nail at a time. This seems easy however I found it lifted a bit too much at times, but thankfully the fix is easy: simply apply another coat of the second polish and dab the saran wrap on your nail again. 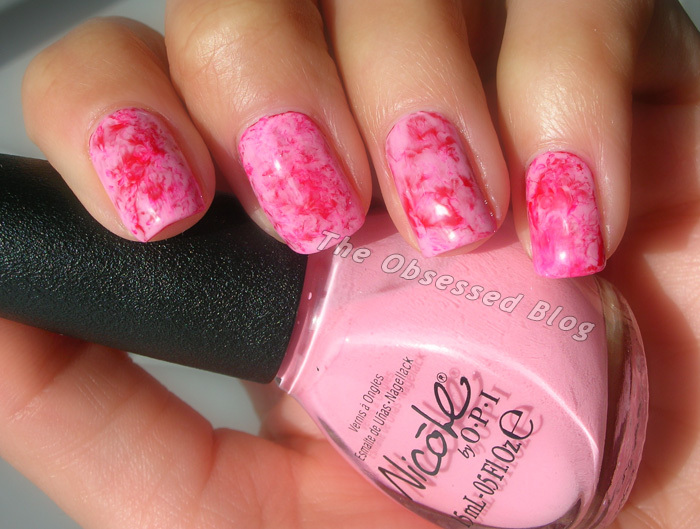 For me, I found it best to let the polish sit for a few seconds after I applied it before blotting. Once all nails were done, I used my cleanup brush to remove some of the excess polish I got on my skin and cuticles. Because the effect can be a bit bumpy, I used two coats of top coat: first, a generous coat of the 3-in-1 to top my finished mani, and then I added a coat of Nicole by OPI’s new Quick Dry top coat. 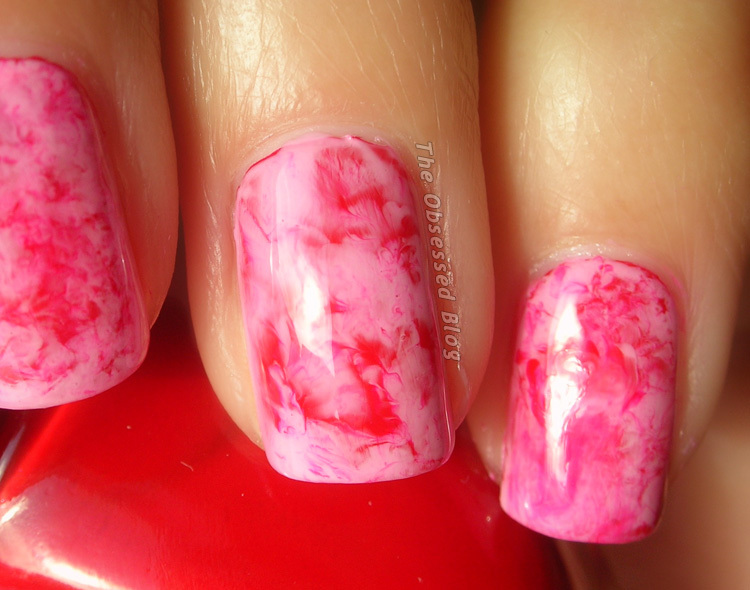 I love the marbled effect that’s achieved! So what do you think of my first saran wrap manicure? 🙂 If you liked this post, please take a moment to ‘like’ this post or comment! I love this. I so want to try this but I’m afraid it will turn out bad. Impressive! I really love it, never tried anything similar. I love this manicure. 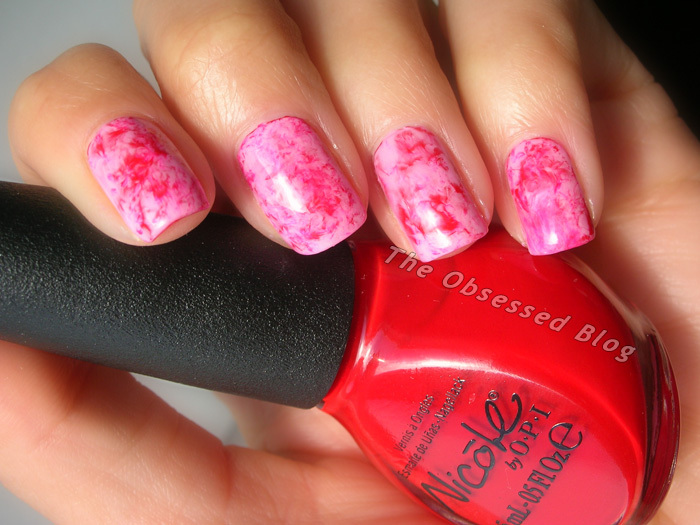 Do you still like this base coat and top coat? I’m looking for some new products. Yes, I do! It’s a great multi-purpose product! The only downside, if I had to find one, is that it’s not a quick-dry top coat, but does dry in fairly good time!